Inkjets, which are losing some of their cachet among consumers, are finding new jobs in small offices and workgroups. We've tested enough business models over the past couple of years to prove that a high-quality inkjet multifunction is faster and cheaper to operate than a comparably prices laser product in the sub-$500 space. A good place to start is with HP's $400 OfficeJet Pro 276dw. 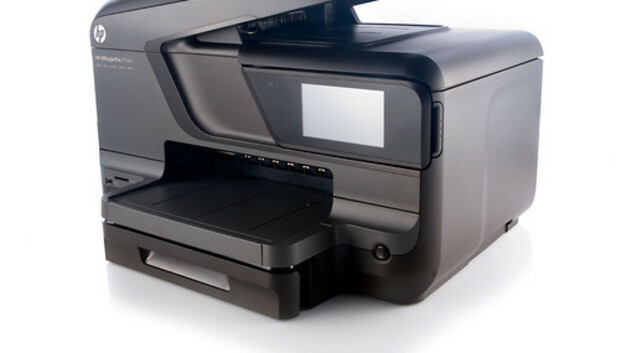 It is expensive to buy, but it's also an excellent inkjet multifunction whose enhanced manageability features lets it play nice even in the corporate environment. The 276dw also installs easily, produces nice output quickly, and ink costs are low. The 276dw is a dark-chocolatey shade of brown, which, while a bit old-school, works well with the printer's soft edges and corners. It sports a large, 4.3-inch touchscreen control panel with a well thought-out menu structure that makes it easy to operate. Software includes HP scan, remote email printing, and a complete onboard management console accessible via your Web browser. Management features include email alerts, a firewall, proxy support, etc. You can reach the management interface via the control panel or your browser. The 276dw sports Ethernet, Wi-Fi, and USB, so you may attach it to your network in any fashion and location that you want. Installation was a breeze: There were no firewall hassles, or other such configuration issues that we commonly see, though there are quite a few dialogs to wade through. Push-scanning to our test PC from the 276dw's control panel was available almost immediately. Quite often it takes printers an inordinate amount of time to get their networking act together. What you see in the 276dw's output tray will put a smile on your face. The text is near-laser-quality, and the color graphics are very nice overall. Plain-paper photos appear ever so slightly washed out, but they look good embedded in newsletters and the like. Color photos on glossy paper are excellent, though HP's bent toward orange-ish skin tones remains. The greenish tint has vanished from its PCL 5 monochrome graphics--a welcome change. It's still found, however, in monochrome graphics printed via Postscript on the Mac. Scan quality is quite good. The performance of the 276dw was smooth (no odd pausing, as with some inkjets) and quick. Most documents fit easily within the printer's 512MB of memory. It printed text pages (which included a few simple monochrome graphics) at a rate of 10.8 per minute (ppm) on the PC and 13 ppm on the Mac. To plain paper, 4-by-6-inch photos printed at a little over 4 per minute, and to glossy paper at a rate of about one per minute. A full-page photo printed at best quality took 2 minutes and 15 seconds on the Mac, and just over two minutes on the PC. However at the default settings, which look nearly as good, you can cut that down to 75 or so seconds. An anecdotal test of printing a relatively simple Excel spreadsheet took perhaps 15 seconds per copy on the PC, but it slowed tremendously on the Mac. We were unable to determine where the fault lay, but look for driver updates if you'll be sharing the 276dw with Mac users. Ink costs for the 276dw are outstandingly low--especially if you purchase the XL supplies: 1.6 cents per page for black and 5.6 cents per page for cyan, magenta, and yellow. 7.2 cents per four-color page is a lot cheaper than you'll get with a laser printer anywhere near the price of the 276dw, and cheaper than most inkjets. The normal capacity supplies add up to about 12 cents for the same four-color page. The difference in actual cartridge cost is so small, you might be tempted to go with the XL supplies. Just remember that if you don't print much, getting too much ink would be overkill. The 276dw carries a standard one-year warranty, but $120 and $140 three-year add-on packages are available. The duty cycle is 30,000 pages a month and the recommended maximum workload is 1,500 pages. Paper handling features include automatic duplex printing, duplex scanning (automatic re-feed), a 250-sheet input tray, 150-sheet output tray, and a 50-sheet automatic document feeder. There's also a 250-sheet auxiliary tray available for $80. The 276dw's management features, smooth setup and operation, low ink costs, and quality output make it one of the nicest experiences we've had with a printer. Overall it's a temptingly nice alternative to a laser printer for a small office or workgroup.